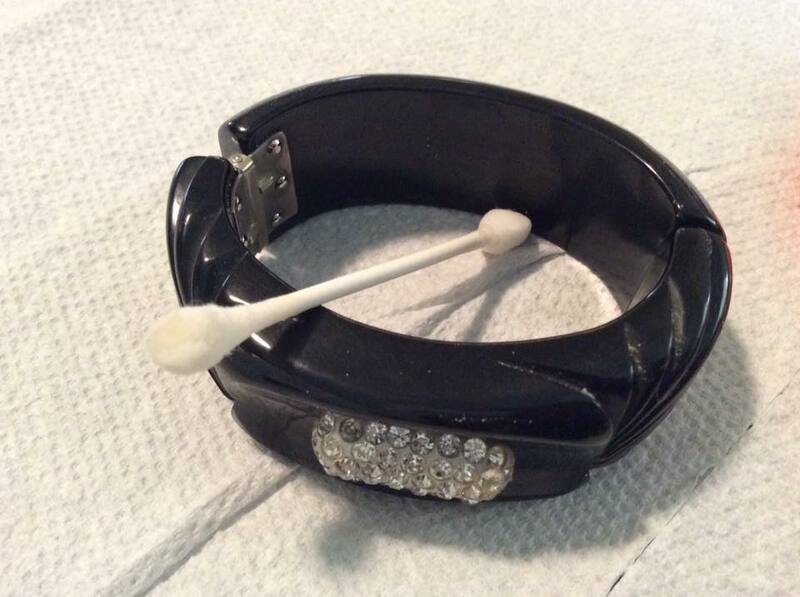 Makeup applicators and brooches? I had to try it! One day while browsing I came across a great webzine article by The Glamourai. It is titled How To: Wear Brooches Better. So I had to take a look, I am always looking for good tips to pass along to others. My mouth dropped when I saw the fantastic idea they shared. I asked my dog pal Rosie with probably too much enthusiasm, “Why has no one thought of this before? This is brilliant!”. I like to think she thought so too. So I pulled out a vintage dress I have stored for “some day” and decided to try it myself. I mean seeing is believing right? I will say, I was pretty impressed so I decided to share my results with you. I knew exactly which brooches I was going to try this with. The first is not very heavy but is large with an extra long pin bar. It tends to flop forward and does not sit very well with a thin material as you can see in the photo below. Getting the pin through the sponge proved to be a bit of a challenge because it is longer than the applicator and I did not want the sponge to bulge. 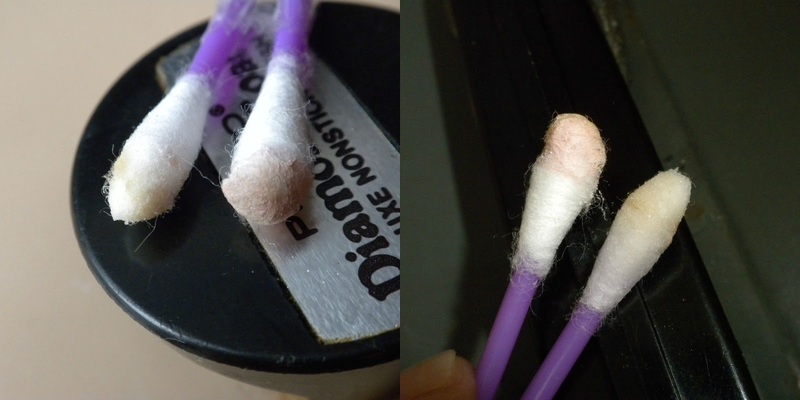 I managed to do it but recommend using a slightly larger applicator for brooches with long pin bars like this. It worked and it worked well! Look! No sagging or flopping! Simply amazing! A different angle so you can see that it is really sitting upright now. All that remained were these two tiny pin holes that would have been a lot worse without the support. The holes in the area I pinned it to the dress with out the applicator were slightly larger. Now the heavy strawberry brooch. This brooch is not huge but it is heavy. You can see how it is pulling on the material in the photo in the bottom photo above. This one was easier to line up with the applicator thankfully. I was impressed again because I was skeptical about this one. But I think the applicator being larger than the brooch helped add support. Again only tiny pinholes left behind. So I guess it is safe to say the proof is in the pudding! This really is a brilliant idea and such an inexpensive solution. I hope passing it on to you helps you save a blouse or two! Be sure to share this tip with all your brooch loving friends! You really can go brooch without fear! The brooches used in this blog as examples can be found in my shop BunnyFindsVintage on Etsy. Hidden object games are not only fun but are a great way to exercise your brain! I loved these as a kid and loved doing them with my kids. The objects used in this one are from GotVintage? Shops members on Facebook. Since I am addicted to vintage, I figured that was the best place to start. Find the 10 objects on the list under the photo below. You can click on the links and see what the object looks like if you happen to get stuck. Objects are hidden among items from All Kinza Stuf on eBay. Hidden object items were found in the Authentic Vintage from GotVintage? Shops group on Facebook. I have recently noticed an influx of friends posting to Facebook publicly. Is it because they did not realize they were venting to the world, or did they? Do they want every single person who stumbles across their profile to know every detail of their lives? It is not so common that someone is going to just stumble across your profile, but let’s face it, public means public. That means my friends can see it if I comment or react, and if they decide to comment or react to your post also, THEIR friends can see it too.. and so on. Facebook explains it here . Here is my version of the pros and cons to posting publicly on Facebook. I am going to start with the cons, because those are what motivated me to write this. 1 – Predators. We hate to think that someone would want to do us, our kids or our pets harm. But let’s face it. They are out there. Posting photos of your personal life and your location can lead a predator right to your door. Keep that stuff for people you approved to be your “friend” on Facebook. Make sure your privacy for these posts are set to “friends” only. You can even customize to be sure only certain friends see certain things. 2 – Privacy. I personally do not comment or react on many public posts that come from friends. I feel weird inviting all my friends, that you do not know, to interact with you. And that is exactly what I am dong if I comment or interact. 3 – Trolls aka Unwanted Guests. You posted for everyone to see, so you asked for it. These people are happy to antagonize you, argue with you, upset you and your real friends for as long as you are willing to let them. Having your post available to the public is an open door. 4. Scammers and Spammers. You posted to the public and leave your profile details open to the public, so again, you asked for it. Scammers and spammers search Facebook for people just like you. Did you know that having your friend list show to the public puts you in jeopardy of having your account cloned? That someone can steal your profile pic, start an account using your name and photo, then they send friend requests to all your friends. Whats the big deal? These people will spam or scam all your unsuspecting friends. Events – Events are usually public and the coordinators appreciate as much exposure as possible. Sharing events publicly can help a lot more than sharing them privately. Business – Facebook is a great resource for business promotions. We all promote a product now and again because we love it. Savvy business owners know that public posts are a true benefit to their businesses. So when I discovered that baking soda appears to be just as effective for testing Bakelite as Simichrome is, I never dreamed I would learn so much. This blog is meant to be more informational than entertaining, so please excuse the lack of bells and whistles. I promise to keep the typos to a minimum and not to destroy the English language too much. Bakelite and Catalin are both phenol formaldehyde resin plastics. Fillers and the molding process are the difference. Bakelite is opaque due to fillers, can stand up to compression molding and does not require polishing. Where as Catalin is translucent, brittle due to the lack of fillers, cast molded and polished. Sometimes it tests with substances, other times it does not. But can pass a smell test. I am still unclear as of why. I’ve read many opinions on this. Does it have something to do with the fillers? Does the formula of black sometimes require less formaldehyde? Does it have something to do with the 3 types of Bakelite ( A B C) and the year it was made? There is a comment section below, if you have something to contribute, please share! This topic could be a whole other blog! There is another type of plastic that sometimes gets in the mix called Galalith aka French Bakelite. It is Casein-formaldehyde, made from milk protein. It is sometimes mistakenly bought and sold as Bakelite. Some say it has tested positive for Bakelite, others say it hasn’t. The smell test would likely be your best friend with this one. As it smells like burnt milk or wet wool with a heat test. I have not yet found a piece of this myself to know first hand, but know others that have. There will be facts and links below for this as well. I am no expert, nor am I genius. As a matter of fact during research I found someone who mentioned baking soda in a forum 2 years ago. (See This Convo) A lot of what I am reading is like a foreign language to me. But this is what I gathered based on the research I did. None of this is meant to be misinformation. So please, if you find something in this blog that is wrong, point it out. The last thing I want to do is misinform anyone. Always test in an inconspicuous area and rub gently. This photo and the one under Catalin were taken of dice that my Jason held onto from his Grandfather. Interesting story on how the dice were acquired. Maybe another blog, the story is quite funny. You are seeing Simichrome on your left and baking soda on your right. The pic is not fab, but the simi did turn yellow. Although it is easier to see with the baking soda, which makes me think it might have one up on simi there. Fillers – Fillers were used to strengthen the phenol formaldehyde resin. Pressure Molded – The material was strong enough to compress. See one of the machines used by Bakelite here. 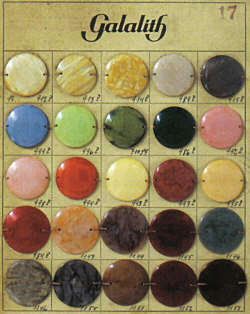 Uses – From what I understand, Bakelite was used for more utilitarian purposes but was used for some decor and jewelry. It seems like black tests easily if it is a utilitarian piece. I tested on a steel file box with Bakelite handles/sides and West Bend electric skillet knob. 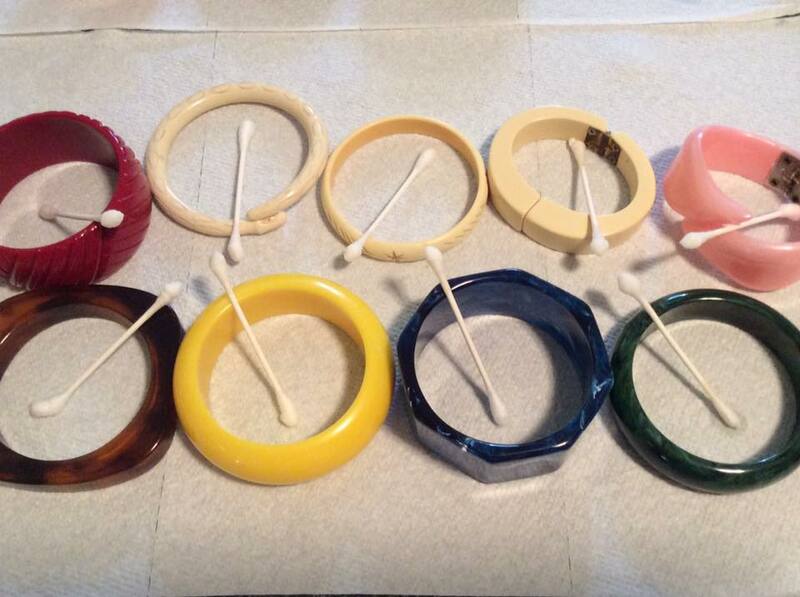 Lexi Lewis of My Gilded Magpie provided a test and photos of two napkin rings. There was a faint yellow tinge with both simi and baking soda, but the black seems to come with it as well. See photo below for her results. 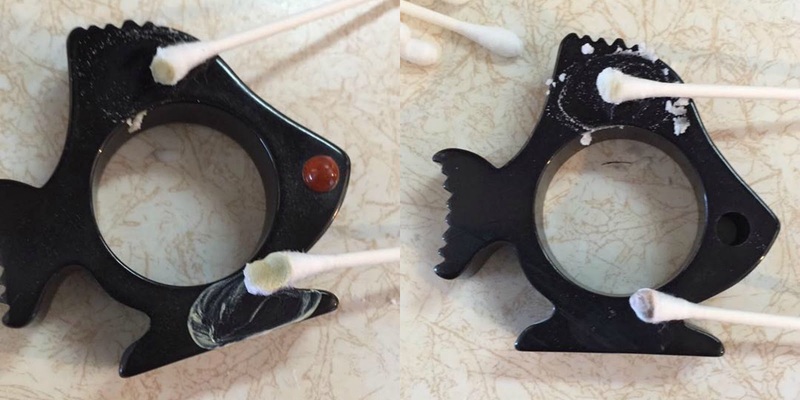 Tonya Arnold of Tahoe Tonya’s tested this black bracelet and got a very faint result. Below are her results. 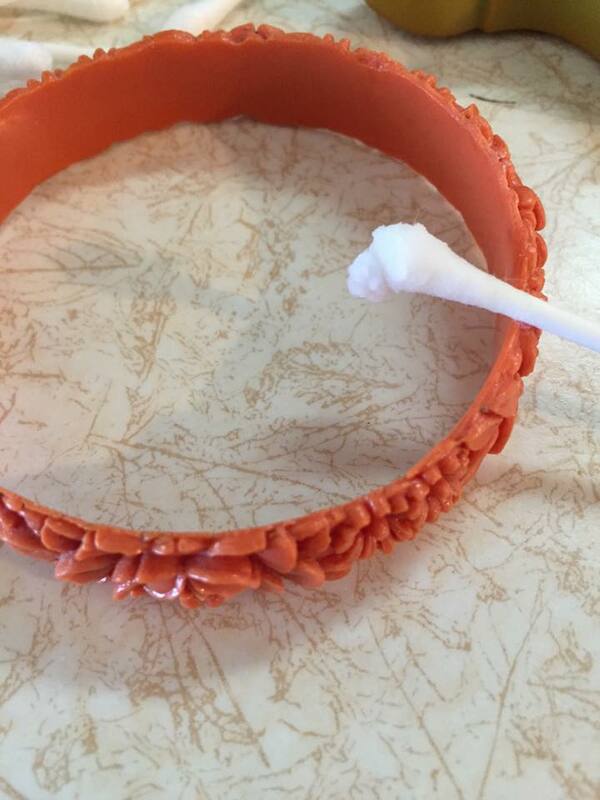 Cast Molded – The plastic was cast, it could not hold up to compression without fillers. No Fillers – No fillers were needed to cast. It is often translucent, transparent, mottled or solid. 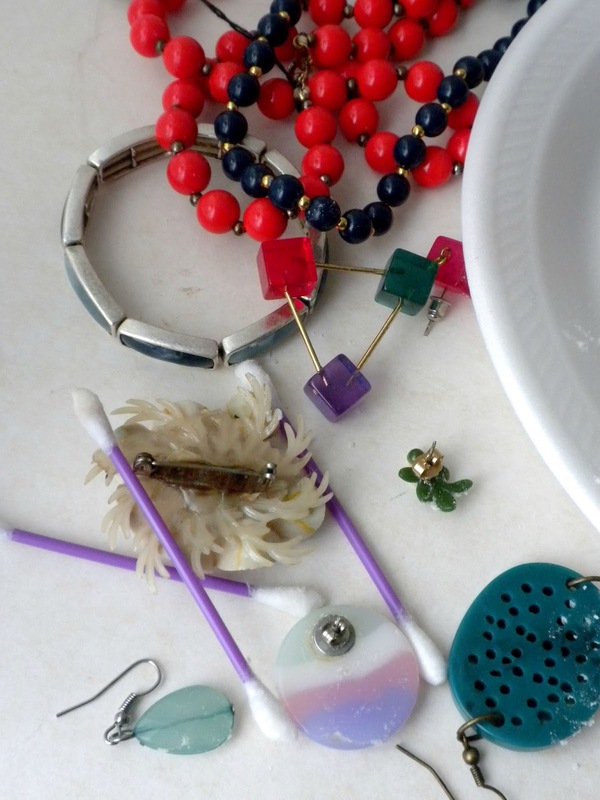 Uses – Jewelry, game pieces and radios mostly, but was used for other items around the home. Cannot be Molded – It was produced in sheets and tubes and worked by hand. Alias – You will likely see, or have already seen, Galalith referred to as “French Bakelite” I am not sure how it adopted this nickname but according to this article it is not correct, and after reading how she puts it, I would say I agree. 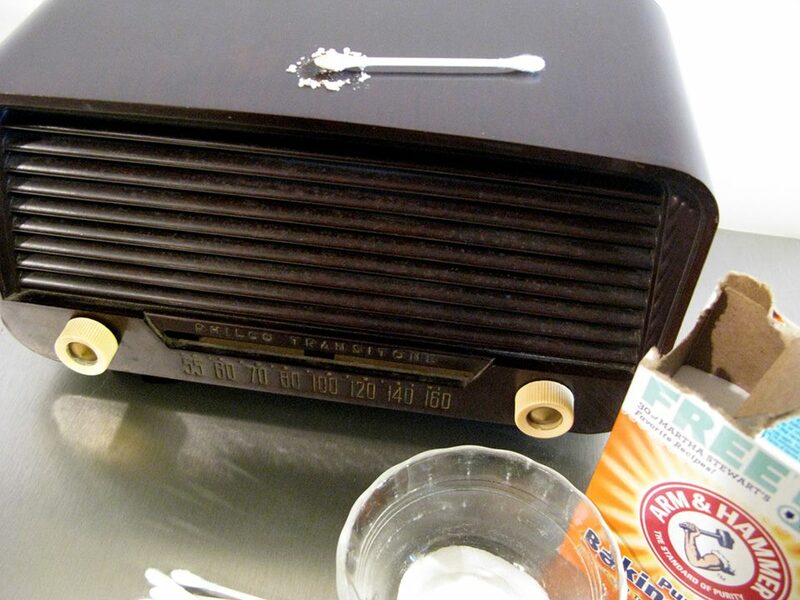 Sara Peluso of Sfuso shared her experience testing her Philco radio on her awesome blog the stories behind the stuffs . If you have never visited her shop, you are missing out. Niki of Past To Pretty also shared her tests and results on her very entertaining, blog Hey That’s Awesome! Again from Lexi Lewis. She was so awesome to test several pieces for us. Tortoise and Apple Juice, she even tested the eye on her AJ piece. 🙂 She used Simichrome and Baking Soda to test. 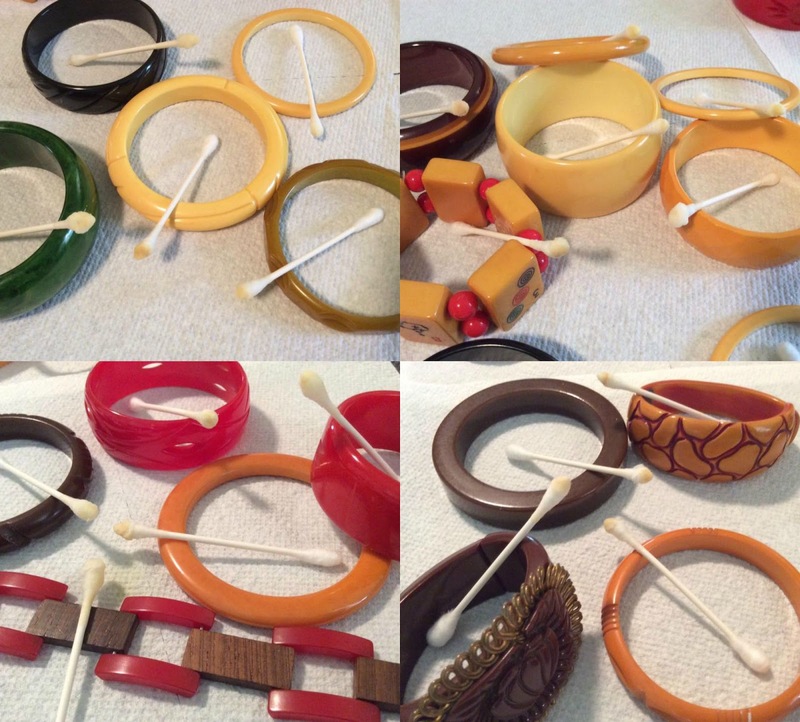 Tonya Arnold tested a bunch of her Bakelite pieces! Tonya looks to her reference books, purchases from reputable dealers and has used 409 to test her pieces. Note just about all of us that contributed tested other plastics to be sure there was no reaction. So far no one has reported a color change on any other plastics. 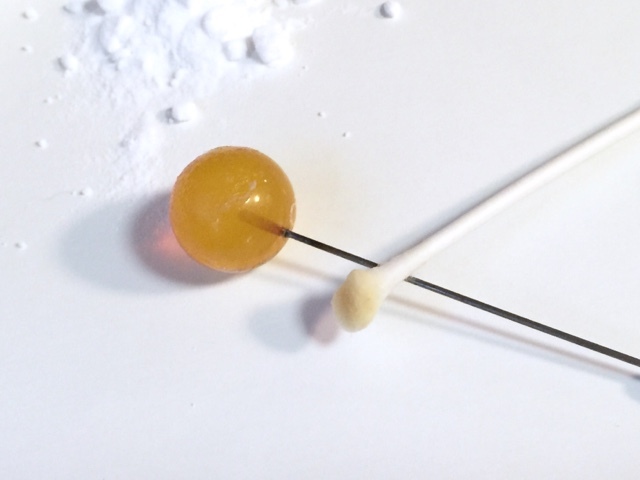 Hot Pin Test – Not Recommended. This method will cause damage. Please do not do this. There is no good reason to poke anything with a hot pin. Regular 409 – Turns Yellow. I personally have never had consistent results with 409 and switched to Simichrome before discovering baking soda works. Pros – Readily available and works great on certain pieces. Cons- Not dependable for results. Simichrome Polish – Turns Yellow. With the exception of black, Simichrome is pretty dependable. Pros – Is usually dependable for testing pieces and is a great polish to have on hand. Cons – Pricey, Not Readily Available for everyone. Scrubbing Bubbles – Not Recommended. I never tried this method because I read it causes damage and is not dependable. 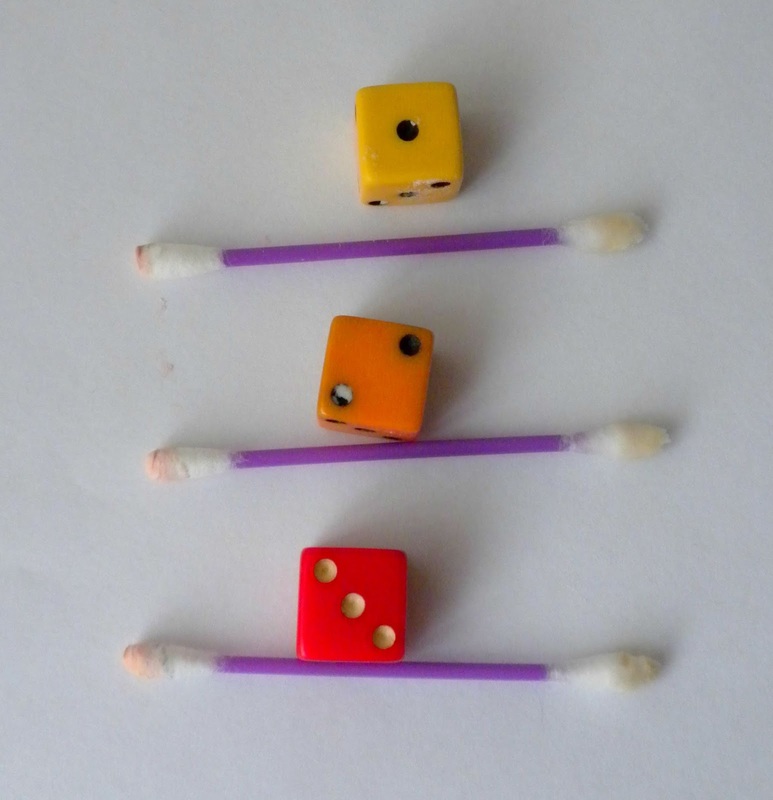 The smell test – If your sniffer works good, this is a great way to test. Bakelite contains Formaldehyde. You can smell it when the piece is run under hot water or rubbed with your finger to create friction. Pros – This test can be done on site, No substances are being used on the piece. Pieces that do not pass a substance test can pass the smell test. Cons – If you do not have a good sense of smell, or if you cannot smell formaldehyde, this just won’t work. 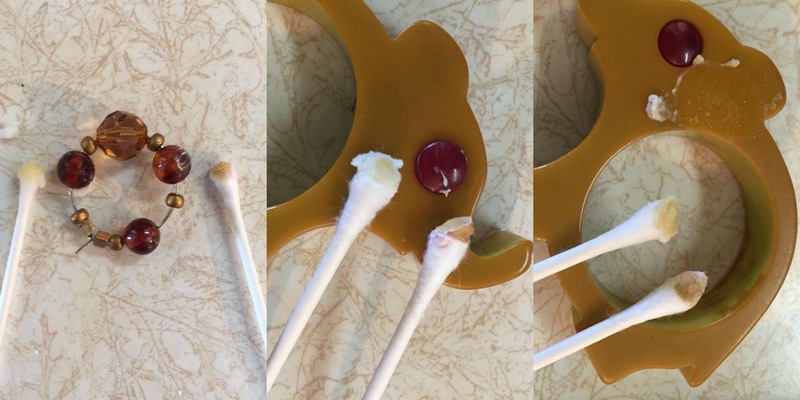 Appearance and Sound – If you handled a lot of Bakelite in your time then this method is likely the one you would use most often. Pros- You can just walk up to a piece with confidence and purchase it. No weird looks from strangers for rubbing a bracelet and smelling it or pulling out a “kit”. Cons – Years of experience is necessary. For a seasoned Bakelite collector this is easy peasy. Baking Soda – Turns Yellow. Seems to be just as good as Simichrome for testing. Pros – Cheap, Easily found, Yellow shows better Cons – Damage is unknown. No one has reported any damages using it. Use caution and do not rub hard, be sure to test, like with anything else, in an inconspicuous area. Well that is all I have for now! If I missed any important details, feel free to include them in comments. I will edit this blog crediting those who provide valid information. Thanks to those who contributed, and to those that take the time to write informational articles. I am hoping this blog helps clear somethings up for some of you or at least is a helpful start! Please note this blog is a follow up to this one.